Struggle with traditional festive food? 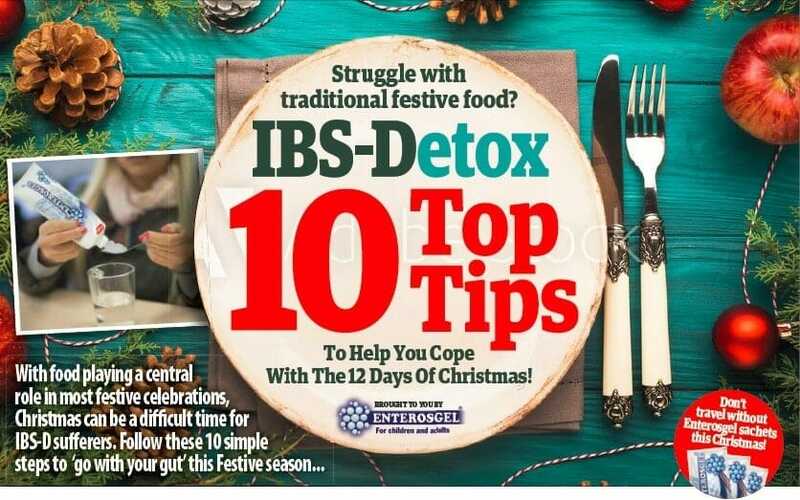 IBS-Detox 10 Top Tips To Help You Cope With The 12 Days Of Christmas! A new survey from Enterosgel® has shown that IBS sufferers believe that stress could often be a main trigger of their symptoms. Christmas time can be stressful. Try lighting a calming candle, use essential oils, walk, meditate and try to get a good nights rest. You know your gut’s ‘triggers’ for diarrhoea, pain or bloating. Dig deep and stop yourself, despite the festive food on offer! This tip from weight loss expert Louise Parker, transformed the looks of celebrities and Royals, but can help anyone. It can help you avoid overindulgence and still enjoying eating. 4. When in doubt, throw it out! If you have any doubts about how food has been prepared or stored, bin it. Bacteria, such as E.Coli and Shigella, produce harmful toxins. 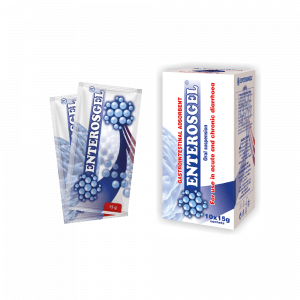 New in-vitro research has proven gastrointestinal adsorbents like Enterosgel® bind to such toxins. Food poisoning peaks during the Festive season, so keep adsorbents at hand. 5. Have breakfast within the first hour of the day. Breakfast is the most important meal of the day. There are a wealth of IBS-friendly breakfast ideas online. Nutritional therapist Julie Silver, author of “Food Awakening” has shared eight breakfast ideas for Christmas at www.enterosgel.co.uk. 6. Don’t be misled by Detox Myths! Many herbal products that claim to detoxify may not be beneficial for your gut flora, and some could trigger allergic reactions. However, mineral intestinal adsorbent Enterosgel® is non-allergenic and completely free from preservatives, gluten, sugar and other additives. Take a table spoon of Enterosgel 3 times a day. It is organic, non-allergenic and completely free from sugar, gluten and preservatives. 7. Go Drug Free with Enterosgel®! Get inspired from success stories of other IBS sufferers by joining the blog network, or simply reading independent online reviews about IBS products and the methods others have used to cope with the same condition. Also check social media such as Facebook and Instagram, or use the hashtag #myibshandbag on Twitter. 9. Better safe than sorry! Alternative therapies, such as probiotics or gastro- intestinal adsorbents, while not always recommended by GPs or gastroenterologists, are very much supported by the nutritional therapists and IBS sufferers as a helpful tool in maintaining gut health! 10. Make the most of your New Year Resolution! Get involved in IBS Research by registering your interest at www.contactme-ibs.co.uk. The aim is to help scientists better understand the condition and develop new treatments. It might just make you feel better by being a part of innovation that can change the future for IBS sufferers!